Murder, madness and mayhem, oh my! The Godwins have lived at Oxmoon for generations and when the story begins in 1913 and is narrated by Robert the younger (all the first born sons of the first born sons are named Robert). 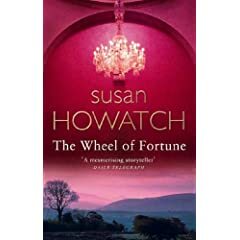 Robert senior struggles to bring the estate back to financial health after it was run into the ground by his mother’s notorious lover, Owain Bryn-Davies. Robert is raised with distant cousin Ginevra (Ginette) and the two maintain a strong bond of friendship that eventually blossoms into love – at least for Robert although he must wait until he’s old enough to declare his feelings – but *something* happens that sends his plans spiraling and Ginette suddenly elopes with another man. The pair eventually meet again years later when Ginette is widowed, but can their love and friendship overcome the horrible secret that caused Ginette to flee Oxmoon in the first place? The story continues with that of Robert’s younger brother John, the stalwart of the family who always does the “done” thing – that is until the just-barely-widowed John meets the very married and terribly unsuitable (common!) Bronwen and falls head over heels in love. Even when she is free Bronwen is not a suitable wife for John and he marries another heiress instead. Will he make a choice for true happiness or continue doing the “done thing”? The last third of the book carries to the next generation with the conflicts between cousins Christopher (Kester) and Harry. Kester is Robert’s son and heir to Oxmoon, but John’s son Harry thinks John should have been the heir and the battle between the two cousins eventually ignites with deadly consequences. The very last section is Hal’s story (Harry’s son) as he returns to Oxmoon to try to find out what really happened between the two at their final confrontation on The Worm’s Head (do Google that and look at the photos – awesome). Of course there’s a whole lot more to the story than that but I am not into book reports. I found this to be a grand ride taking me from the early 1900’s on through the 1960’s, and Howatch’s method of using alternating narratives of the main characters is awesome (PG and Weir you should take lessons from her). I loved seeing the relationship between Robert and Ginette from both perspectives, and I adored John’s story as he struggles to do the right thing even when his heart is pulled into another direction. As for the stormy love-hate relationship between Kester and Harry – wow, just wow. The very last with Hal I didn’t care for as much and I almost wished Howatch had left off after Harry’s story, but she ended up pulling a couple of excellent twists that I was not expecting. One final note and that is the twist on this book, is that the Godwin’s story parallels that of England’s Plantagenets – Edward III, Edward The Black Prince, Joan the Fair Maid of Kent, John of Gaunt (yes, there is a Katherine), Richard II, Henry Bolingbroke (Henry IV) and Henry V. For readers who like bit fat meaty sagas with a healthy dose of soap opera angst and anguish this just might be the book for you. 5/5 stars and highly recommended along with her two books that precede this, Penmarric and Cashelmara.